Our annual Summer Exhibition at the Peter Pear's Gallery in Aldeburgh. Inspired by Alan Marshall’s bestselling book Suffolk Jewels, this print exhibition explores the architecture, history, landscapes, flora and fauna of Suffolk and brings together the printmaking talents of 18 artists who have been inspired by our wonderful county. Featuring established and new artists, familiar and less familiar places, and a range of techniques from lino and woodcuts, collagraph, screenprints and copperplate engraving, explore Suffolk as you’ve never seen it before. Featured artists include: Carl Borges, Amelia Bowman, Fiona Carver, Louise Davies, Sally Freer, Greta Hansen, Celia Hart, Amie Haslen, Joan Hodgkiss, Leanda Jaine Hughes, Isabel Hutchison, Clare Johnson, Maria McGuchan, Helen Maxfield, Elizabeth Morris, Sue Scullard, Graham Spice, Glynn Thomas and Henrietta Villers. Eleven artists and craftspeople from the Walsham Le Willows area, including SCS makers Alison Dane (jewellery), Helen Dougall (batiks) and Mary Jane Toulson (weaving). A collection of work for sale by East Anglian artists including members of the Suffolk Craft Society. The Art Of Making in Suffolk - workshops for adults led by five selected Suffolk Craft Society makers in April 2018. A collaboration between SCS and Snape Maltings. All workshops take place at Snape Maltings. The price is £86 per participant, including all materials and a light lunch. To book contact Snape Maltings Box Office on 01728 687110. Download the leaflet here for more details. An opportunity to make unique and colourful jewellery using paper as a base. This workshop is designed for people with an interest in colour and some manual dexterity.During the d ay participants should make at least one unique piece of wearable jewellery. Using a metre of material, fabric paints, pens and assorted household objects, participants will learn a variety of special techniques that can be easily recreated and used at home. The emphasis will be on exploring techniques for making unique fabric designs. Participants will be introduced to different techniques of wet felting using Merino wool to make a flat felt picture. During the workshop demonstrations Katie will include making felt balls and ropes as well as showing how the texture and the embellishment of felt work may be developed. We delighted to be bringing our Christmas Show to the Suffolk Food Hall for the first time this year. Those who supported us at Gallery 2 (when we were in Ipswich town centre) will not have far to come to find the work of many of their favourites and some new makers. We look forward to making many new friends who already love the Suffolk Food Hall and what it stands for. The Suffolk Craft Society is delighted to show a selection of its Maker’s work in the Gainsborough’s House Shop. We do hope that visitors will find something to make their visit to Gainsborough’s House special. The Norwich Print Fair is celebrating it’s 22nd year by bringing together 29 of Norfolk and Suffolk’s most exciting printmakers including our own Sally Freer. They display a wide variety of hand-made print disciplines in the biggest independent selling show of its kind in East Anglia. As can be seen left, Sally was demonstrating aspects of her screen printing processes to the many interested visitors. The Fair continues daily until Saturday 16th September and Sally would love to welcome fellow makers and friends on Saturday when the NPF holds its Open Portfolio Day. Our annual Summer Exhibition at the Peter Pear's Gallery in Aldeburgh is now over for this year. After ten successful years in Ipswich Town Hall, the Suffolk Craft Societyhas closed their town centre exhibition space. Operating Gallery 2 for a decade through some turbulent economic times and through many changes within the venue is an achievement to be proud of. Over 100 Suffolk Craft Society members, along with local amateur makers, visiting designers from further afield and new graduates have had the opportunity to exhibit their work and make sales in the calm and airy gallery space curated by Gallery Manager, Sarah Young, for the last decade. When Gallery 2 opened to the public in 2006, the Visual Arts Ipswich department, run by Ipswich Borough Council, was curating a changing programme of contemporary art in Gallery 1. Ipswich Museum Services were curating Gallery 3 upstairs but nothing stays the same for long! Gallery 1 is now run by Town and Tea as a creative café venue, while Gallery 3 is hired out by various local arts groups. The opportunity for exhibitions and sales in Gallery 2 has been a bonus for many Suffolk Craft Society members over the last decade. Gallery 2 has been invaluable to introduce and showcase the Suffolk Craft Society’s newest members, whether they be established professionals, or the 14 new graduates welcomed through the Making It initiative. Making It is a Suffolk Craft Society initiative offering recent graduates with a Suffolk connection the opportunity of support in bridging the gap between education and the market place with a two year period of membership, providing access to exhibition and gallery selling opportunities as well as a supportive network of fellow professional makers. Some Making It members had studied locally and aimed to stay locally to set up a business and others had been away to London or further for study but returned to Suffolk to set up a professional studio. Sarah Young has a keen eye for new design talent and often invited guest exhibitors to come to Ipswich to exhibit amongst our local artisans. Memorable exhibitors include Claire Loder from Bath with her amazing ceramic heads and Fine Cell Work, a social enterprise that trains prisoners in needlework skills, exhibiting beautiful textiles. Sarah has also curated an exhibition of hand crafted furniture and another one of musical instruments in Gallery 2. In 2013 and 2014 Gallery 2 hosted Open Craft Exhibitions with the aim to engage and connect with local makers who may aspire to joining this highly regarded Society of crafts people. Approximately 40 local makers took part. The Suffolk Craft Society is very grateful to the many regular customers and supporters of Gallery 2 over the last decade. The group will continue to promote and support their makers through the year, with exhibiting opportunities around the county, the main annual focus being the Summer Exhibition in Aldeburgh during July and August. They are interested in discovering new venues to set up professional exhibitions or for showcase areas to sell and promote their makers work. If you are interested to find out what the Suffolk Craft Society does next, do connect via Facebook, Twitter or join their email or postal mailing lists. There is a busy and sociable Friends association who enjoy demonstrations and studio visits through the year. 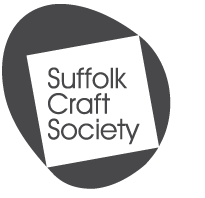 You can find details on how to join the Friends of the Suffolk Craft Society here. The very best work from past and present members in our permanent gallery in Ipswich. 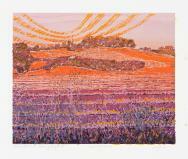 Helen says "I create limited edition linocuts from my home studio near Needham Market in Suffolk.  I work in both colour and in black and white. My black and white designs have a bold, graphic quality where I enjoy the mark-making potential of the medium. Coloured designs are created using the 'reduction method' where each colour is printed one at a time and further lino is carved away inbetween printing." The next of our New Makers Exhibitions will showcase the work of printmaker Greta Hanson, glass artist Lynn Foster and ceramic artist Mary Wyatt. The next of our New Makers Exhibitions will showcase the work of furniture maker Niall Craig, bookbinder Paul Garcia and printmaker Bryan Whiteley. Over the next three months we will be showcasing the work of the newly selected Suffolk Craft Society Makers. The exhibitions will take place at our gallery/shop in Ipswich. Ten applicants were successful in becoming members at the last selection meeting, they are bringing to the society a varied and inspiring selection of work including ceramics, glass, jewellery, printmaking and book-binding. The Open Exhibition will feature the selected work of craftspeople from around Suffolk and its border towns. You don't have to be a member of the Society to have your work considered for selection. But you do need creativity and skill! Here are the details and application. Drop in to see and buy the latest work from our talented members. Plus a large selection of work from many other members. Come to admire or buy! The group meets monthy at the Willowmead Alpaca Centre in Otley and each meeting has a theme or focal point. The diverse mix of skills within the group provides a broad lively environment in which to work. Jill Desborough's beautiful Puppets will be on show in Gallery 2 this September. bodies are modelled in wax then cast in a type of resin and painted with enamels, the puppet is then assembled, dressed and wigged. The characters are inspired by mythology, fairytales and often flights of imagination. An exhibition of beautiful, bespoke, handmade furniture and musical instruments by Peter Owen. Former head of the property-making workshop at the National Theatre, I began to focus exclusively on woodwork more than 30 years ago. As a freelance craftsman I design and make furniture, and undertake commissions for all kinds of woodwork. Having worked for several years with Thomas Goff (1898-1975), who had been at the forefront of the early music revival during the 1950s and 1960s, I extended my own interest in keyboard instruments. I build both single and double-strung clavichords, and have recently developed a Viennese-action piano. I work on my own, using mainly hand methods with a minimum of machine tools, in my stables-converted workshop on the Essex/Suffolk border. I have a keen interest in traditional and regional furniture techniques and prefer to work with British-grown timbers such as oak, elm, ash, chestnut, sycamore and fruitwoods; whenever possible I use locally-grown woods. My furniture and musical instruments have been exhibited across England over the past 30 years and my latest work can be seen regularly during open days at my workshop. For the past 20 years I have taken part in the musical instrument makers’ exhibition at the annual Suffolk Villages Festival. Holly Eden (printed Textiles) and Kathryn Baxter (Glass) are successful applicants of the 2014 'Making it' award. An exhibtion of their work is currently on show in Gallery 2 until the 19th April. Tues - Saturday 10am - 5pm. Opportunity for graduates to apply for the Suffolk Craft Society 2014 'Making it Scheme' see here for more details. Located in Cornhill, right in the centre of Ipswich, the grand 1868 building in yellow coloured Bath stone, red Sandstone and Limestone is unmistakeable. The finest sales outlet for contemporary designer crafts in East Anglia with a changing display of members work, The standard of excellence of the work is ensured by our rigorous selection for membership. 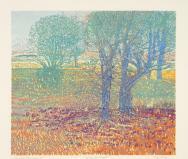 See Online Shop for examples of members craft work that is available in Ipswich. Lift access is available through the side entrance in Princes Street. There is ample parking in the town centre and park-and-ride bus stops are only a couple of hundred metres away. 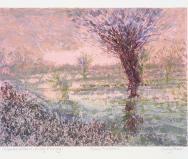 Gallery 2 is operated in partnership with Visual Arts Ipswich.